Here is how to watch UFC 217 Bisping vs St-Pierre on Kodi for Free. We left you some important tips to make sure you won’t have problems streaming this UFC match. UFC is absolutely massive and the recent Mayweather v McGregor fight has only increased its popularity. Saturday, November 4th is going to see two of the biggest brawlers in UFC go head-to-head in a fight unlike anything else and fortunately if you’re the proud owner of a Kodi device you can watch this epic UFC middleweight battle-royale for free! Kodi is all about the add-ons & luckily for you, there is one for UFC, in fact, it was actually called UFC Finest earlier, but it’s now known as Planet MMA. When is the UFC 217 Bisping vs. St-Pierre fight? The UFC 217 Bisping vs St-Pierre fight takes place on Saturday, November 4th 2017 and is the main card of the evening. Fight fans can start watching almost 4 hours earlier as the preliminary cards kick off at 6:30 pm NYC time (EST) which is 11:30 pm on the 4th in the UK. Security – VPNs create a tunnel between your device and the server that is streaming the content you are interested in. This tunnel blocks any outside observers from monitoring your activity and with the recent rulings that allows ISPs to block Kodi streams of sports matches, this is your only safe way of ensuring you are protected and your stream won’t be blocked. A secure VPN will also help you not get a DMCA or copyright infringement notice from your ISP or copyright protection agencies. Geolocation – UFC has a massive following around the world, but it is only aired in certain countries and only on certain channels which are often not available globally. This means that unless you live in one of those countries, you’re pretty much out of luck and will be unable to view the fight regardless of the add-on you’re using. The only way around this block is to ensure that you are viewing the content with a VPN as the VPN can mask your location making it seem like you’re in a different country. How to install a VPN in FireStick. MMA Randoms and Test Area. 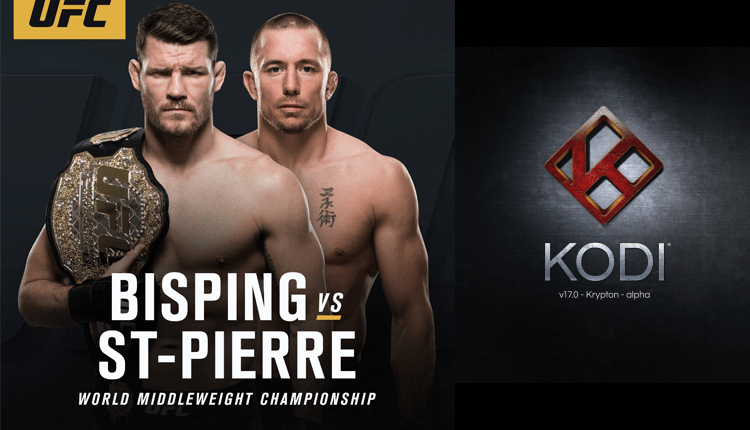 Planet MMA is a great add-on for UFC and our best recommendation to watch UFC 217 Bisping vs. St-Pierre on Kodi. Not only does it give access to the live streams, it’s also a great way of streaming replays and UFC documentaries, not to mention movies and films too! I’ve talked about this before but as a reminder, with Kodi there are two steps whenever you install a new add-on. The first is finding the repository and the second is installing the file itself from the zip file stored in the repository. For Planet MMA you need to install the Ares repository. On the home screen, go to the addons section and click on install from zip file and select the ares folder that we had previously created. Select the zip file and wait for the add-on installed notification to appear on your screen. Go back one step and then select install from repository and select ares project. Go to program add-ons and select ares wizard and then click on the install button and once again wait for the installation complete notification to appear. Now that you’ve installed the repository, the next step is to install the add-on. Go to add-ons and click on ares wizard to launch it and then click on browse add-ons on the Ares Wizard home screen. Select video addons and then choose planet mma from the list of available add-ons. Click on install and then wait for it to download and install. The following alternatives should let you stream UFC events but if doesn’t work, they also have live sports tv channels. For example in UK, it will be transmitted on BT Sport 2, so you can connect the IPVanish to UK and use one of the following options to watch BT Sport 2 online. Now that you’ve got the add-on or app and your VPN in place you are good to go! Just wait for the night of the fight, and Planet MMA will search the net for all of the workable links to the fight for you! Sit back, relax and be thankful that it is not you in the ring as that looks painful! thanks! It’s really good when people recognise our efforts, thanks!